This chapter reports on the performance of governments in providing public hospitals, with a focus on acute care services. Expenditure on public hospitals (excluding depreciation) was around $63.8 billion in 2016-17, with the Australian, State and Territory governments funding 91.6 per cent (non-government sources funded the remaining 8.4 per cent). Nationally, in 2016-17, government expenditure on public hospitals was equivalent to $2606 per person, similar to 2015-16 ($2603) in real terms. In 2016-17, there were 695 public hospitals in Australia – 3 fewer than 2015-16. Although 68.1 per cent of hospitals had 50 or fewer beds, these smaller hospitals represented only 13.4 per cent of total available beds. There were approximately 6.6 million separations from public (non-psychiatric) hospitals in 2016-17. Nationally, this is equivalent to 254.2 separations per 1000 people. Acute care separations accounted for the majority of separations from public hospitals. A total of 35.5 million individual service events were provided to non-admitted patients in public hospitals in 2016-17. There were 7.8 million presentations to emergency departments in 2016-17. Governments aim for public hospital services to meet these objectives in an equitable and efficient manner. 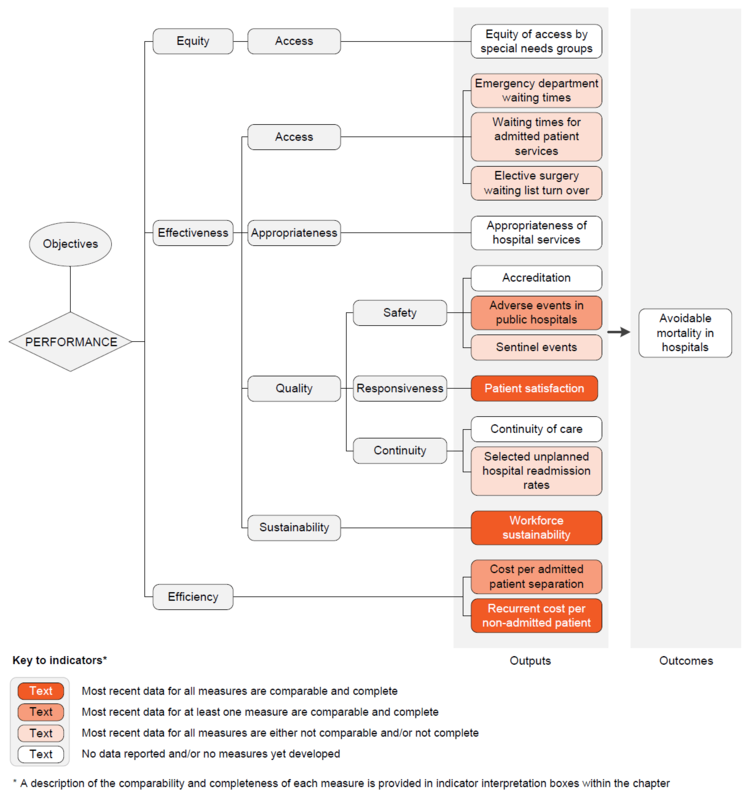 The performance indicator framework provides information on equity, efficiency and effectiveness, and distinguishes the outputs and outcomes of public hospitals. The performance indicator framework shows which data are complete and comparable in the 2019 Report. An overview of the Public hospitals performance indicator results are presented. Information to assist the interpretation of these data can be found in the indicator interpretation boxes in the Public hospitals chapter and attachment tables. Most recent data for this measure are not comparable but are complete, subject to caveats. Data are available in tables 12A.24-31. Most recent data for this measure are not comparable but are complete, subject to caveats . Data are available in tables 12A.38–46. These data and caveats for these data are available in chapter 12 and attachment 12A. # Proportion has a margin of error >10 percentage points which should be considered when using this information. – Nil or rounded to zero. np Not published.